Out of nowhere the Evad3rs have turned Sunday Funday into an early Christmas present to all the little boys and girls. They released an untethered jailbreak for iOS7 with no heads up at all. Not even the Cydia developer Saurik (Jay Freeman) knew about this, thus Cydia has not been fully tested and mobile substrate does not work correctly, which is required for a lot of tweaks to work. This means they are going to have to push out a new version of their untethered jailbreak to fix this oversight. Now onto the good stuff about the iOS 7 Untethered Jailbreak. It is super easy to use and works on all devices running any form of iOS 7. This includes IOS 7.1 beta 1 and beta 2. Just so you know the supported firmwares are iOS 7.0, 7.0.1, 7.0.2, 7.0.3, 7.0.4. 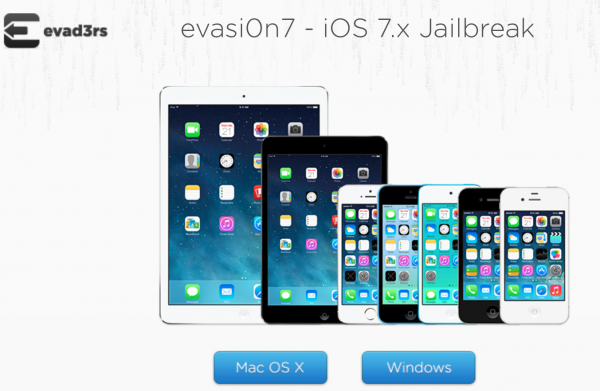 To jailbreak your iOS 7 device all you have to do is download Evasi0n. Make sure to download it from the Evad3r’s official site: http://evasi0n.com. Launch the program and click jailbreak. It is that easy. You will however want to make sure you have a backup of your device incase something goes wrong. Happy Early Christmas. Your wait is finally over!! Are the tweaks in the LEI Mobile repo ( http://beta.leimobile.com/repo/ ) iOS 7 compatible? Specifically “APN Editing” (1.0.1) &/or “Edit APN” (0.0.1-1)?